Ed Sheeran has officially become the world’s most popular artist on Spotify based on global monthly listeners – overtaking the likes of The Weeknd and Drake. 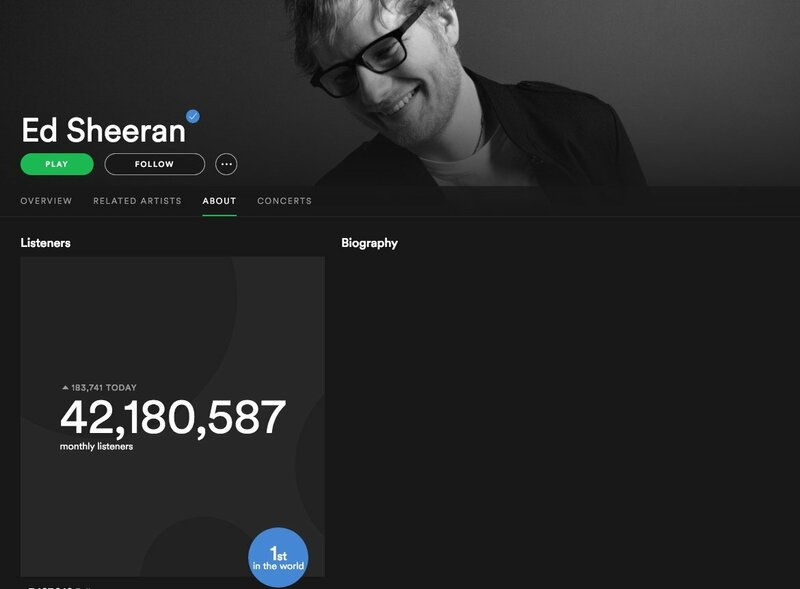 Almost six weeks after releasing his two record-breaking comeback singles, Atlantic-signed Sheeran has established 42.18m monthly listeners on the Swedish platform, which equates to around a third of its total active users. Meanwhile, Shape of You has now notched up over 300m plays on Daniel Ek’s platform, while Castle on the Hill has over 150m. 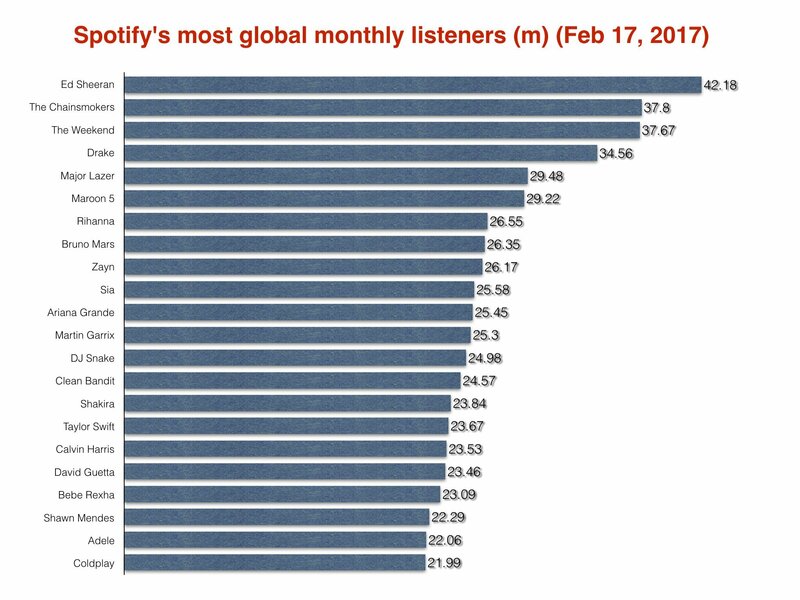 Spotify’s global listener rankings are calculated on a rolling monthly basis. Sony act The Chainsmokers are currently in 2nd place with 37.8m monthly listeners. Other interesting entries: largely thanks to her recent collaboration with Zayn, Taylor Swift is currently Spotify’s 16th most popular artist with 23.67m monthly listeners – despite almost all of her catalogue not being available. Also, Adele is Spotify’s 21st biggest artist of the past month (22.06m listeners), a position which is likely to move up following her Grammy ‘sweep’ on Sunday. Sheeran’s fellow UK acts Zayn and Clean Bandit both claim spots within the Top 15, with over 50m global monthly listeners between them. We’re pretty sure that Sheeran’s current 42.18m listener haul is the biggest of all time. In December, The Weekend, with 36.1m listeners, overtook Drake at No.1 on the list – where the Canadian rapper had reigned for over six months. On today’s rankings, The Weeknd (signed to UMG label Republic), is third in the world with 37.67m listeners, while Drake (Cash Money) is fourth with 34.56m. To give you an idea of Sheeran’s ascent on Spotify, back on January 8 – when Shape of You just started to break records – he was the 25th biggest artist in terms of global monthly listeners with 20.33m. In December last year, Sheeran didn’t even warrant enough monthly listeners to make the Top 25. Sheeran’s popularity is set to grow even further with today’s release of How Would You Feel (Paean) – the third revealed track from his upcoming third album, ÷ (pronounced “divide”), which is out on March 3rd. Drake recently became the first artist to reach 1bn spins on Spotify with a single song: One Dance has now notched up 1.113bn plays to date. Drake was also 2016 and 2015’s most played artist on the platform, and is the most streamed artist of all time on Spotify with over 8.7bn plays.